7:30pm 9pm Kitchen. Kandi and Dina playing cards. 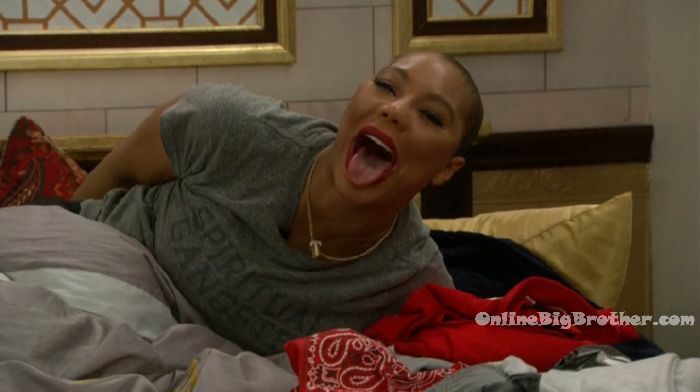 Meanwhile Tamar, Lolo and Ricky are sleeping in the bedroom. 9:50pm Kitchen. Lolo talks about the issues she’s had with Olympic teams and other Olympian having issues with her for no reason. 10:10pm Bedroom. Tamar and Lolo chatting. Lolo – so you’re basically telling me we’re both f**ked? Tamar – If its up against me and you… they’ve got to vote for one of us.. you know what I’m saying? If you go up against another person .. they’re going to pick the other person. You’ve got Natalie, yeah. And Tom, maybe. Who else? Who? You know not Ryan and on the account of Ryan you no not Joe! And on the account of Ryan and Joe .. you know it ain’t Jonathan. And you know you didn’t get to know Mooch that well. If I’m not up there, then me. Who else? Ricky? If I go up against him, you know everyone is going to choose him. Lolo – you think? Tamar – just like you said!? Come on?! Lolo – I hate to talk about money but what is second place. Tamar – 75K! It ain’t shabby! Its helpful. Its helpful to me and I can be honest about that. Lolo – its a year. Tamar – girl! Its more than a year for me.. its like moving! 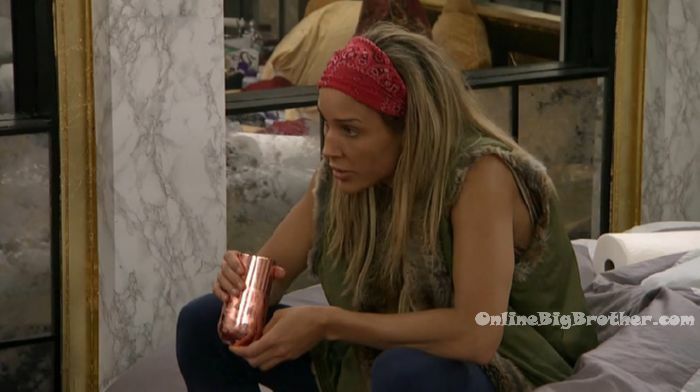 Lolo – do they give another one for America’s Favorite?Tamar – I don’t know. Its not that much. Its not as much as the regular one and I think that one is like 10k. I trust god, and I know he will provide! Lolo – if second place isn’t that bad .. even if you know they’ll vote for Kandi.. can you be like Kandi I put you in the finals. 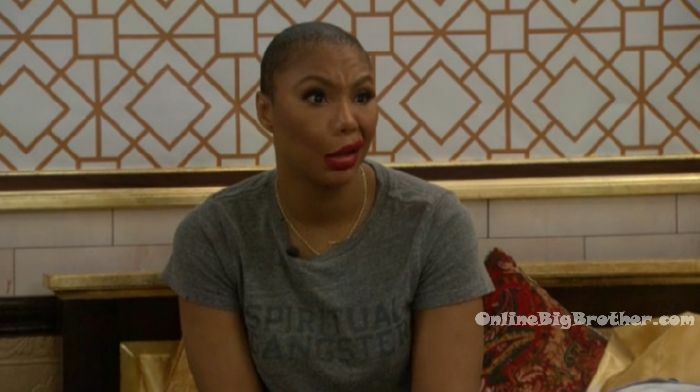 Tamar – I don’t owe Kandi anything. KANDI IS RICH!! Its Mooch and then there’s Kandi! YES! Okay! Remember when I first got in here and I said Kandi’s got a lot of money ..what the f**K is she talking about?! Kandi’s restaurants are like 10! A year! M’s! Lolo – stop it! Tamar – M’s! M’s! Just that M’s! Okay! Get your life! M’s! Lolo – are you sure?! Tamar – 20 years! M’s! M’s! Lolo – I feel so bad for fighting for it. Tamar – this is the ground work. This is what shapes you. This is how when you lose it all … you know how to get it again. This is how when you trust in god and you’re like however you want to follow me follow me.. you know what I mean! This is when you dig in the dirt and get what you need! And dig for your plant and plant your seed so it will grow. I don’t have a problem. I’ve lost it and got it gain and lost it and got it again. It happens to everyone. Its about getting again and keeping it. There’s no shame. This is nothing for Kandi. She makes like $110,000 per episode. Lolo – I didn’t know that. Tamar – K?! Get your life! This is Vegas for her. I’m not trying to put her business out there.. I’m just keeping it a 100! Lolo – so what happens if Dina or Kandi wins veto? That means one of us goes up? Tamar nods yes. Lolo – how do assure one of us doesn’t go home? 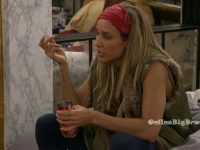 Tamar – we have to wait till after the veto and talk after the veto. The ceremony isn’t until Wednesday.. we have time. Lolo – okay. 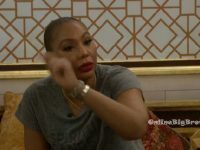 Tamar – we have to see what happens first. We’re f**ked if they win the veto. We have to f**king win the veto. Period! Lolo – I hope its just one thing we f**k up … like in a good way. Like faces .. I think we are both going to be good at faces. Its just the numbers.. the numbers have me so f**king scared Tay! And like I get it big brother but damn! Ricky’s got it down like this (she snaps her fingers). Tamar – Kandi do too! Ricky joins them. They reminisce about past events of the season. 12am – 12:50am Kitchen. Tamar cooking. Kandi playing cards. Dina doing her nails. Tamar points at Lolo’s suitcase between the bed and says its a hazard. Tamar and LOLO both lack self awareness. They can’t understand why others tangle with them instead of their reflecting inwards. Both are pathetic. Sending hellos from sunny Punta Cana. We’ve been unable to watch from here while on vacation. Big thank you to Simon and Dawg for keeping us up to speed!! I’ve had enough Tamar to last me a lifetime. She is so annoying. That eviction dance of her was all class…….without the “C” & the “L”. Bring back Tom and Kato. Bring back Ryan ffs, who was royally shafted by everyone save a few not on the darkside. Who do you think are “second string” last minutes fill ins? My guess is that the fill ins were Lolo and Natalie Eva Marie. Since we know Mooch started following some spoiler sites a year ago (making the not a real hg story less plausible), and it makes sense to have a housewife and a foil for the housewife so there is guaranteed early storyline strife we know that mooch kandi and tamar were brought on early together. kato as house guest is the ultimate tongue in cheek. i’d be assuming one of dina or jonathan was a second choice fill in. because the mean girls joke isn’t good enough to tell it twice. natalie brings in a different market. joey fits the way back when nostalgia. tom brings in the oddball. ricky brings in the former pro athlete angle. one of Lolo or Ryan would be a second choice fill in because they fill the same role and cater to the same market. So if there were two fill ins, i’d be pretty sure that one of dina or jonathan as well as one of ryan or lolo was brought on as the second string. I was never bought the “Mooch not really a houseguset” storyline. I believe once Mooch (or his associates) realized how much sensitive information could be disclosed in this format, he decided (or was encouraged) to hit the eject button …QUICK. He realized he would be first one out, and wouldn’t have the opportunity to put out information more likely is my guess. also thought about it more, about what individual market niche each one fits. I still think my four choices are the most likely, but have narrowed to three. Jonathan would have checked the casting lgbt box, so two of dina lolo and ryan. Were there only two people that quit before the season started? Does anyone know? Mooch. Seems like he signed on before he understood what he was in for. 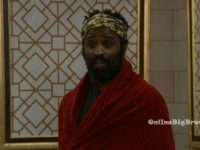 Likely had to film that lame “Mooch themed Veto” as a way to get out of his contract of staying in the house until eviction. One day he went into the Diary Room and never came out. He looked like a mess the last time they showed him on camera, like he hadn’t slept for days. Then all of a sudden they called everyone to the living room and Mooch is announcing a new Veto ceremony lol. And it was basically just look at pictures and then walk somewhere to write an answer down, no buzzer, no countdown clock. Obviously not of the same quality as the usual ones. But they’re letting him be part of the jury or is he gone for good? Interesting convo with Kandi and Ricky at the chechboard around 11pm. He may have just been working her for a jury vote. 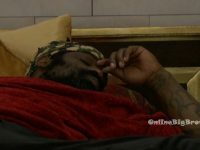 Did anyone else see Ricky and Tamar yesterday afternoon (3:30 -ish) when they were talking about it being the right time to take Lolo out? They agreed that is Kandi or Dina take themselves off the block, Ricky would put up Lolo and they could takenher out. At least that’s what I heard – I had it on in the background and wasn’t really listening til then. Dina said she wasn’t leaving til she won a comp and this is the time for her to win. 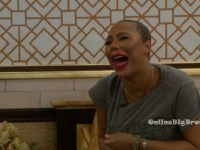 It would put Tamar in the position of voting out Kandi (and dealing with the fallout in her personal life) or voting out Lolo after she promised not to. “Lolo talks about the issues she’s had with Olympic teams and other Olympian having issues with her for no reason.” Do I sense a theme here in Lolo’s life?! … And why does it matter if Kandi is rich? Just like last season when everyone (aka – Rockstar) was bitching about who needed the money the most, this is NOT a charity show. Sorry, I don’t like people who throw around the “are you trying to threaten me?” meme just to shut down discourse. That scene between Tom and Kandi at the pool table was cringe worthy and infuriating to watch. Now that all my favs are gone. Jonathan Ryan Kato Tom and Natalie. I can only hope that Ricki wins. Simon the pics you post if Tamar are too much. It really shows her crazy. Pet peeve again; if she knows her Bible, there is none righteous, no not one. And “for ALL have sinned and come short of the glory of God.” God will not give you advantages in a game show, especially when you are dropping GD’s Jesus loves Kayo & Tom Green, too; just saying’. I thought I had read somewhere Carson Kressley was suppose to be on this CBB.